Nobel Laureate Albert Einstein used to play violin in a string quartet with historic Technion architect and faculty member Prof. Alexander Baerwald. In the recession after WW1, dreams of making the Technion a functioning reality were slim, and Einstein was invited to come visit the waiting buildings designed by his friend and to advise on the dream of opening a technical institute in Haifa. On that day, the Nobel Laureate and his wife planted two trees to mark the occasion. On his return to Berlin, Einstein would open and chair the world’s first Technion society – the initiation of an apparatus that would generate a century of progress, teaching and expansion as the decade by decade, the Technion could anticpate and meet the needs of a fledgling nation. On the 100th anniversary of the Technion’s first cornerstone, Technion’s Prof. Dan Shechtman was awarded the Nobel Prize for Chemistry. He is today Technion’s third Nobel Laureate, joining Prof. Avraham Hershko and Aaron Ciechanover. All three of them follow the spirit of scientific integrity and excellence in pure research displayed by founding father Albert Einstein, to whom the Technion owes so much. Scroll down to absorb a little of the Technion’s Nobel legacy. global Nobel Laureates at Technion City. Technion 2011 Nobel Laureate Danny Shectman will be joining a list of Nobel Laureates who planted trees to celebrate their visit to Technion. The tradition was begun by Prof. Albert Einstein – Chairman of the first Technion Society, who planted two palm trees in 1923 in front of the Technion’s majestic first building in Hadar, Haifa. 1921: Albert Einstein initiates the Technion Nobel tradition. Nobel Laureate Trees planted at Lokey Park and on Technion soil. 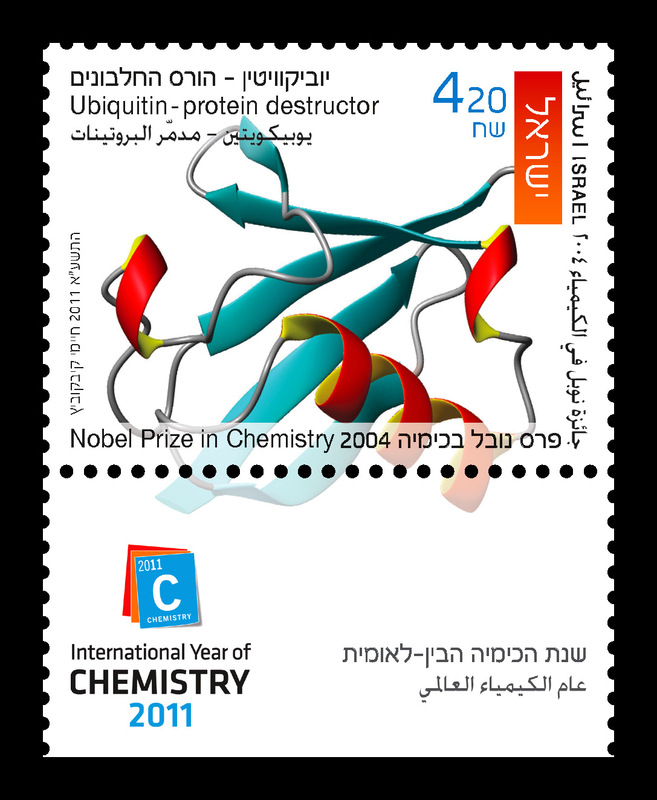 Technion’s Nobel Laureates in Chemistry – Collect the stamp, and watch this space for a New Nobel Edition! Technion Prof. Ehud Keinan, President of the Israel Chemical Society, had the vision to celebrate the international year of chemistry in a manner suited to the world-class position of Israel’s three Nobel Laureates in science. With determination and application, he engineered the release of official stamps celebrating the Year of Chemistry, and Israel’s Nobel Laureates. Proteins are the machines that drive our bodies. They are responsible for all our activities, from the beating of our hearts, to walking, seeing, hearing, digestion, respiration and even the secretion of waste materials. Unlike useful items that surround us, like furniture and clothing, our bodies’ proteins are dynamic. They are constantly being destroyed and rebuilt, again and again. Our bodies destroy on a daily basis up to 10% of our proteins and generate new ones instead. This phenomenon raises interesting questions: why does this process occur at all, and how does it occur? Which diseases would happen if this mechanism was to fail? How can we cure such diseases? As part of the body’s quality control mechanism, proteins are destroyed after fulfilling their specific function in case they have been damaged by heat, by pollutants, by genetic mutation, or simply because they are no longer needed. Professors Aaron Ciechanover and Avram Hershko of the Technion – Israel Institute of Technology, and Irwin Rose of the University of California, Irvine, USA, were jointly awarded the 2004 Nobel Prize in Chemistry for discovering the mechanism that removes damaged or unnecessary proteins. These proteins are labeled for destruction by another small protein called ubiquitin, whose general structure is shown on the stamp. The structure was adopted from W. J. Cook and his coworkers, the Journal of Molecular Biology, 1987. Once tagged by this “kiss of death” the labeled proteins are removed by a biological shredding machine called the proteasome, while sparing healthy, untagged proteins. Aberrations in this protein destruction process may result in numerous sicknesses, including certain types of cancers and brain diseases. Many pharmaceutical companies are working to develop drugs to combat such diseases. One such drug to treat multiple myeloma, which is a form of blood cancer, is already used clinically. acknowledged for the ribosome graphics.